News: the Williams and Tsien-designed former American Folk Art Museum in New York will be demolished just 13 years after it was built to make room for an extension to the neighbouring Museum of Modern Art (MoMA), despite an outcry from architects, conservationists and critics. In a statement last night, MoMA director Glenn D. Lowry said the museum will move forward with designs by Diller Scofidio + Renfro to extend its existing building over the site of the former folk art museum designed by American architects Tod Williams and Billie Tsien and completed in 2001. The decision follows a six-month study that investigated options for its retention. "The plans approved today are the result of a recommendation from the architects after a diligent and thoughtful six-month study and design process that explored all options for the site," said Lowry. "The analysis that we undertook was lengthy and rigorous, and ultimately led us to the determination that creating a new building on the site of the former American Folk Art Museum is the only way to achieve a fully integrated campus." Williams and Tsien have described the move as "a missed opportunity to find new life and purpose for a building that is meaningful to so many". "The Folk Art building was designed to respond to the fabric of the neighbourhood and create a building that felt both appropriate and yet also extraordinary," they said. "Demolishing this human-scaled, uniquely crafted building is a loss to the city of New York in terms of respecting the size, diversity and texture of buildings in a midtown neighbourhood that is at risk of becoming increasingly homogenised." 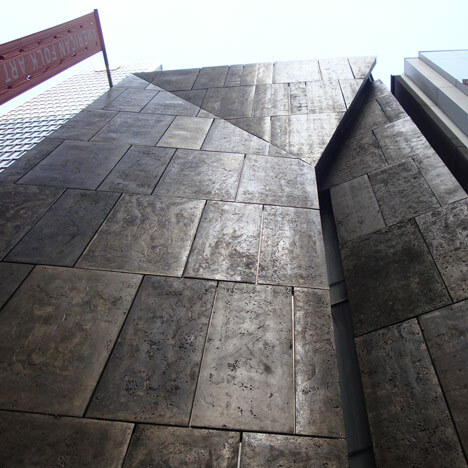 The bronze-clad museum first opened its doors in 2001 to exhibit a collection of paintings, sculptures and crafts by self-taught and outsider artists, but relocated to a smaller site on Lincoln Square, further north in Manhattan, after the building was sold to MoMA in 2011 to pay off a $32 million loan. However, Williams and Tsien believe the building already holds a "powerful architectural legacy". "The inability to experience the building firsthand and to appreciate its meaning from an historical perspective will be profoundly felt," they said. Diller Scofidio + Renfro's expansion will add approximately 3700 square metres (40,000 square feet) of new galleries and public spaces to the museum. It will extend across two sites west of the museum's midtown Manhattan building, including both the folk art museum site at 45 West 53rd Street and three floors of a new residential tower underway next door, allowing the existing lobby and ground-floor areas to be transformed into a large public space. The Museum of Modern Art's Board of Trustees today approved initial details of a major building project that will expand the Museum's public spaces and galleries to provide greater public accessibility and allow the Museum to reconceive the presentation of its collection and exhibitions. Working with Diller Scofidio + Renfro, the renowned interdisciplinary studio based in New York City, the Museum has developed a plan to integrate its current building with two sites to the west of the Museum's midtown Manhattan campus into which it will expand: three floors of a residential tower being developed by Hines, at 53 West 53rd Street; and the site of the former American Folk Art Museum, at 45 West 53rd Street. The plans include new gallery space on three floors within the tower, and a new building on the site of the former museum. The plans approved today are the result of a recommendation from the architects after a diligent and thoughtful six-month study and design process that explored all options for the site. The analysis that we undertook was lengthy and rigorous, and ultimately led us to the determination that creating a new building on the site of the former American Folk Art Museum is the only way to achieve a fully integrated campus. As a major component of the Museum's desire for greater public access and a more welcoming street presence, the preliminary concepts approved today will transform the current lobby and ground-floor areas into an expansive public gathering space, open to the public and spanning the entire street level of the Museum, including The Abby Aldrich Rockefeller Sculpture Garden. In advance of these plans, the Museum will increase free public access to the Sculpture Garden later this year. The extension of MoMA's galleries to the west on its second, fourth, and fifth floors will add a variety of spaces and allow the Museum to present an integrated display of its collection across all disciplines—photography, architecture, design, film, media, prints, drawings, performance, painting, and sculpture. These carefully choreographed sequences will highlight the creative frictions and influences that spring from seeing these mediums together. The expansion will add approximately 40,000 square feet of new galleries and public areas, providing 30% more space for visitors to view the collection and special exhibitions. The additional space will allow the Museum to show transformative acquisitions that have added new dimensions and voices to its holdings, drawing from entire collections of contemporary drawings, Fluxus, and Conceptual art; the archives of Frank Lloyd Wright; and major recent acquisitions by such artists as Marcel Broodthaers, Lygia Clark, Steve McQueen, Robert Rauschenberg, Gerhard Richter, Mira Schendel, Richard Serra, Sophie Taeuber-Arp, and Cy Twombly, among many others. Our vision for MoMA's next phase will be completed over the coming years, and I look forward to updating you on our progress.